Ah, the old warrior, fresh from missing out in the runfest at Khulna, has cashed in today with a 148 in the second test. This was his 29th test hundred, made in his 98th test match, and he continues an exemplary conversion rate which means when he reaches 50, he makes it to 100 every other time. This is his 12th highest test century, not even half way to his career best of 313 against Sri Lanka in 2009 in Karachi. This is Younis’s third test ton against Bangladesh, with the other two both coming in Chittagong, where he made 200* in 2011, and 119 as long ago as 2002. His previous best at Mirpur was 49. This was the 18th test century made by Pakistan against Bangladesh (number 19 followed three overs later) and Younus joins Mohammad Hafeez as the only Pakistanis to make three test hundreds against them. Rahul Dravid at Headingley in his 2002 “we don’t seem to be able to get this chap out” tour. Alastair Cook’s 148 at Adelaide in his tour for the ages in 2010/11, where he followed up his 235* with this knock. Those were the days. One for Arron, Robin Smith’s 148* at Lord’s in 1991 when he marshalled the tail superbly and made a magnificent hundred. Though not a regular captain of county or country, he had an improbable run of success as skipper: Marlborough over Rugby, Cambridge over Oxford, Gentlemen over Players, Lancashire over Yorkshire and England over Australia. Bet he’s on Metatone’s Mafia hitlist (well, he’d been dead over a century, so that’s probably pointless). Anyway, the almanack entry gives you the facts of the first test 148. Les Ames made an unbeaten 148 against South Africa at The Oval in 1930, and Kenny Barrington an unbeaten 148 against the same opposition at Kingsmead, Durban in the period intervening Steel and Pataudi. Tony Greig made two scores of 148 in 13 months – once in India at the Brabourne, Mumbai, and once in Bridgetown. Greig and Dravid have been dismissed twice for 148, while Barrington and Tendulkar have a dismissal and a not out to their name of that score. This was the 26th test hundred made at Mirpur. At time of writing, given Azhar Ali is not out overnight, Younis ranks in 6th place, has the highest score for Pakistan (beating Taufeeq Umar’s 130) and was the second Pakistani to make a hundred at this venue (again, obviously, Taufeeq being the first). The ground record is held by Shivnarine Chanderpaul and Mahela Jayawardena who both made unbeaten 203s. 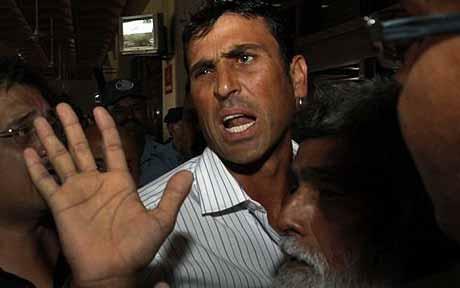 Younis Khan’s century came up in 142 balls and contained 9 x 4 and a six.